Obituary for Janet Carmen (Ely) Roan | Knight-Confer Funeral Home, Inc.
Janet Carmen Ely Roan, of Trout Run, peacefully transitioned to heaven Friday morning, November 23, 2018. 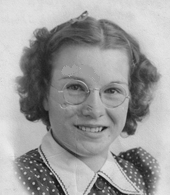 Born in Calvert to the late John and Mary Ely on April 3, 1921, Janet was the youngest of five children and a 1939 graduate of Ralston High School She was predeceased by her husband (George) of 64 years. In keeping with the Ely tradition of longevity, Janet lived to be 97. She was predeceased by her siblings: Annie Dewald (108), Karl Ely (87), Martha Winner (100) and Scott Ely (100). Janet was the mother to six children: Dale (Noreen) Roan of Mt. Airy, MD, Naomi Hevel of Camp Hill, PA, Marty Messner (Sheldon) of Liberty, Phyllis Ridge (predeceased by Lindsey) of Roaring Branch, Clyde Roan and Doug Roan both of Trout Run. Fifteen grandchildren and 29 great grandchildren additionally provided great joy to her life. Always a country girl at heart, Janet loved gardening, baking and canning vegetables from her garden. She was happiest when feeding her many beloved chickens, birds and dogs. As a life long fixture in the Rose Valley area, Janet was active as a 30-year Sunday school teacher and the family historian. She was immensely proud of her scrapbooks, chronicling the events of the area over the last 97 years. Janet loved yard sales, reading and helping people whenever she could. She loved sitting in the sunshine and watching nearby wildlife. It is our belief that she is sitting in the sunshine now with her husband, siblings and all of her other friends and family who have passed on. A funeral service to honor the life of Janet will be held 11 a.m. Tuesday, November 27 at the Beech Valley United Methodist Church, 30 Beech Valley Road, Calvert, PA. Burial will be held privately in Beech Valley Cemetery. A light luncheon, catered by Janet’s grandchildren, will be provided at the Beech Valley Grange Hall (next to the church) following the service. In lieu of flowers memorial contributions may be made in Janet’s name to, the Salvation Army, 457 Market St. Williamsport, PA 17701 or the YWCA, 815 W. 4th St. Williamsport, PA 17701.